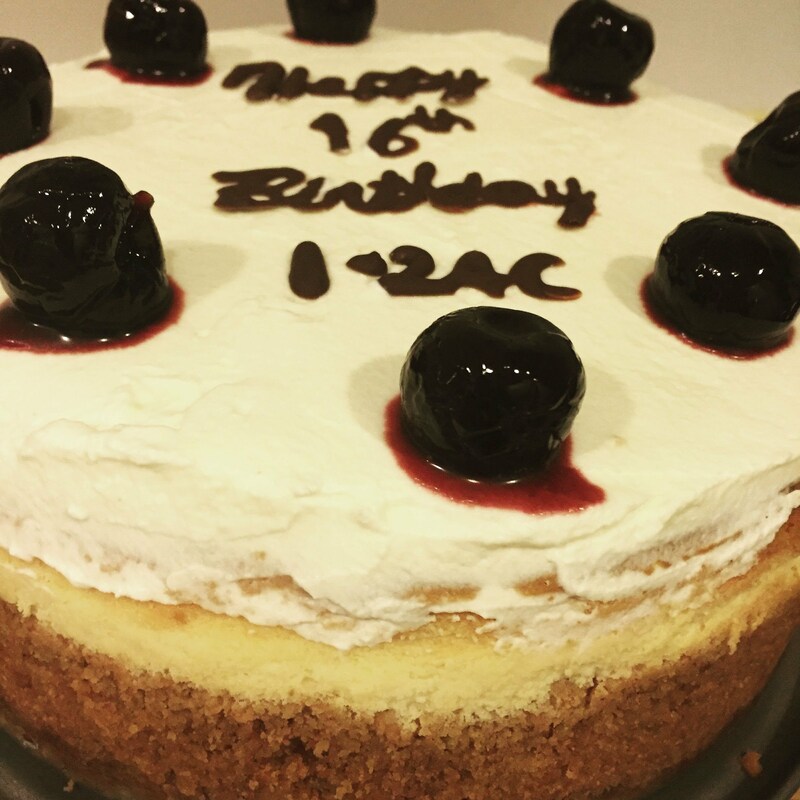 My son celebrated his 16th year old birthday on 20 October this year. This year seems just so normal. I usually plan way ahead what kind of cakes that I'd make, design it on my little note book, and usually its by layers. I asked him what cake do you want. He said cheese cake. Ok, he didn't specify what cheese cake. So, I was planning a black forest for the base, no bake cheese cake 2nd layer, chocolate mousse 3rd layer. So, its sounds delicious. This cake will probably take me 3 days to get it done. Luckily I had vanilla essence, butter, sugar. So, following the methodology I started the bake on Monday to complete everything on Tuesday. The base, then the cheesecake. Baking in the bath with low temperature was the key to an almost perfect cheesecake. Mine broke, but I let it cool slowly in the oven as per advised in the blog, and it all came together. I was going to cover up the cracks with whipped cream anyway. After the 2nd day, it was assembly time. Whipped up cream, put on the top only, as I wanted the layers to be seen from the side. The day before, I also had words written out from chocolate, and cooled in the fridge. I have bad handwriting, so thought I'd just print out what I need to put on the cake, and use it as a stencil. Finally, putting the cake together. To at least make it look a little more presentable, added cherries that was soaked in kirsch, boiled in cornflour to thicken the sauce. This cake is very soft, creamy, not too heavy, not too sweet because I reduced the sugar, added lemon. As there were some extra cream cheese and the graham biscuit, made into smaller ones, top it with some extra chocolates that I had, put into paper cups to be easily distributed. My son said that this cake is not sweet enough, but his friend love it. Usually cake takes about more than a week to finish, this time, 2 days, and its gone. I'm totally satisfied with this bake, worth the time. In 2010, my son visited Australia on his own with his grandparents. He had a great time there, hanging out with his cousins, helping out at the warehouse where my sister and my brother had import and export businesses. When he returned home, he handed me a magazine, and said, mom - present for you. MasterChef Magazine July 2010 - featuring Adriano Zumbo's Macaron Tower. And make this…..pointing at the cover page of the cover photo. Macaron Tower. Turned the page to the recipe and the method, I thought, this was too difficult. I said to my son. Ok, make this for your birthday. 2012, my son was turning 13. I recalled that I promised him a Macaron Cake. In search of an easy recipe, I went online, and 2-3 weeks before his birthday, attempted an online recipe. It turned out no good at all. I decided to follow exactly the way it was instructed in the magazine. Using my little notebook, I decided to make a chocolate cake as the triangular tower, and stick the macaron with a toothpick onto the cake. Each of the macaron puff up nicely, smooth surface and I just make a very simple chocolate filling. The assembling was a challenge, I was never good at art, and trying to make it look beautiful, elegant is just not me. Tried my best to have it stuck to the chocolate cake without each of the macaron being coated with chocolate finger prints, I managed to tower up. The kids had a great time, and when I brought it out, kids were impressed and they were snatching up the macarons and gobbling up the chocolate cake. I was totally pleased with it. 2013 came. My son and I were just surfing the net. In Singapore, there was a craze over Lady M's Mille Crepe that just opened shop in Singapore. I was totally curious. Isn't crepe easy to make? Why are these people paying so much for such cakes? So, here I am, early in the year, told my son, my challenge this year for your birthday cake is Mille Crepe - Ok? He said ok.
And there I was couple of weeks before his birthday, thinking how am I going to make the crepe without a flat pan. I went online and started to search for the recipe as well as a pan that I can make think layer of crepe. I was lucky to find an electric one. Again, 2 weeks before, I tried one of the recipe, and tried to learn how to use the pan. Obviously, it took me a while to master the flipping, the evenness of the wet dough on the pan. I used a mix of 2 recipes from online: 20 Layer Crepe Cake by Ellen Easton 2009 and Tasting Table - Best Pastry Chefs - Mille Crepe Tiramisu. Making the crepe was easy enough after the first few attempts. I was trying to make the tiramisu filling and I think I over beat the mascarpone cheese, it turned watery. I just couldn't use it. Had to run out to purchase new ones to make them. Luckily I was in time. I even had time to make wordings from chocolate. I probably made 30 layers of crepe tightly packed. This time we only invited 2 of the other boys over to celebrate with him. The Italian friend that is so fussy with food had like 2 extra servings, I guess the Tiramisu taste suits him well. Again, assembling is not my strength, but the overall cake was absolutely tasty. November 2013, my husband's birthday. I decided to make a traditional Blackforest Cake. It's just one of those times when I just like things simple, back to basic, no nonsense type of cake. I had a collection of Cordon Bleu cookbooks and one of them featuring Cakes. This is one book that I used quite frequently. The cake turned out fluffily, moist, and we don't like lots of cream, so, I half the cream to be used. I guess if its for selling, I would have used more cream. I just love my dark chocolates that I had used to cover the whole cake. Not a cake to be kept long, best to have it on the day it was made. Its 2014, half the year has gone by, our main celebrations are usually end of the year, so what challenges should I give myself? 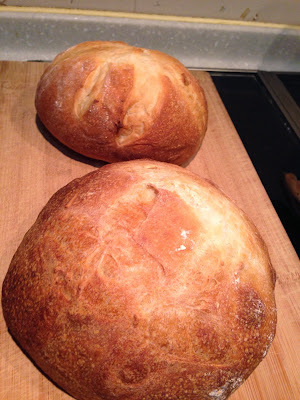 I have been busy baking, just not updating this site. 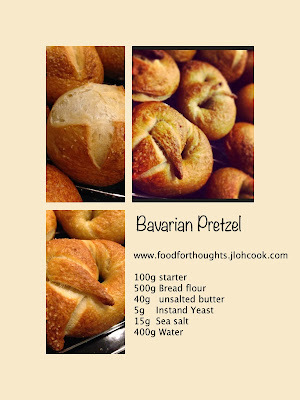 I have been baking several favorite recipes over and over again, and tweaking the recipes a little here and there. 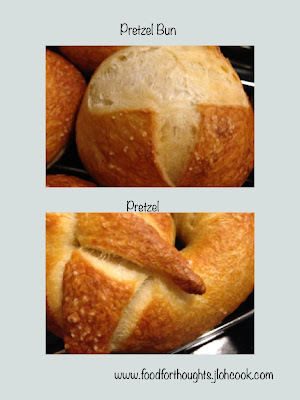 One of them is using the Pizza recipe, and turning it into a roll. Brushing the top with a mix of olive oil, paprika, cayenne, dried herbs such as thyme, parsley, rosemary. This is one of the favorites for the kids! In no time, it's gobbled up. 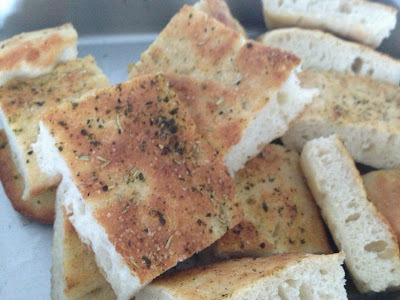 Another variation using the Pizza dough is Focaccia. I learnt this from an Italian mama, its so easy and can be done within 4 hours, its done. Great as a party food. 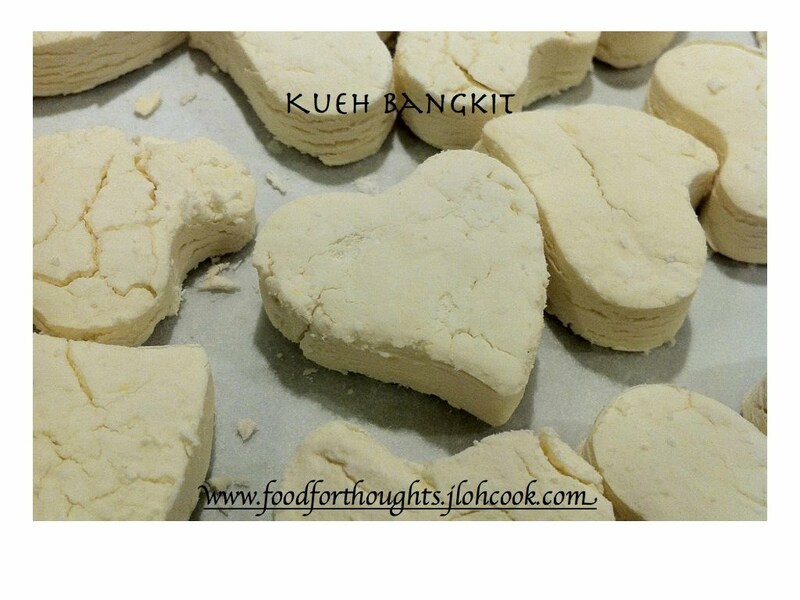 Using a rectangular pan, pour some olive oil, pan the dough using fingertips till it is all spread out. 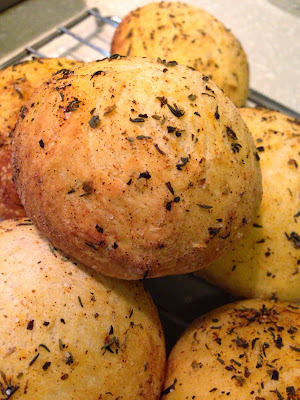 Brush with olive oil, throw some herbs such as rosemary or thyme, shake some salt over. 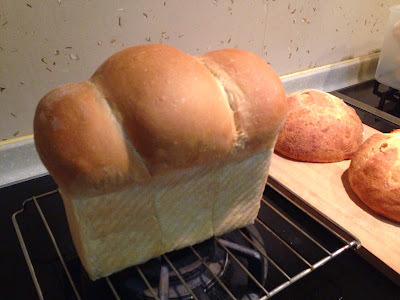 Another one that I like is the simple white loaf that I got the recipe from a Japanese web site, using Google translate, figured out what the recipe says. And, why must white loaf be in the shape of a loaf? Why can't it be round? Well, I made it round! 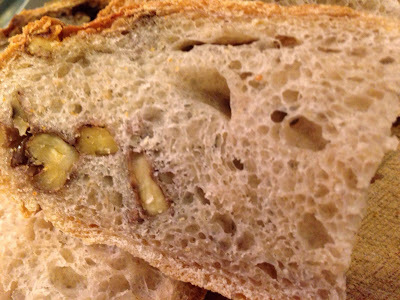 Another favorite is the Deli Rye Bread, love that it's soft, open crumb. So, why not mix a little with whole wheat, add herbs or nuts? Why not turn it into a burger roll to make a burger? 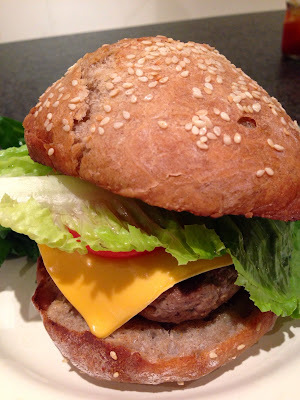 This burger is healthier, and certainly taste better! I simply love experimenting, and try out new things. Perhaps it's time to focus on this.